We have an a bunch of extra hamburger buns at the house post-Memorial Day gathering. We already had veggie burgers one night, so I had to think up something else for the rest. I decided to try a new sloppy joe recipe, did a quick Google search and came up with one on jamieoliver.com. I had everything on hand already — even better. You can get these on the table in less than an hour — you can’t beat that. 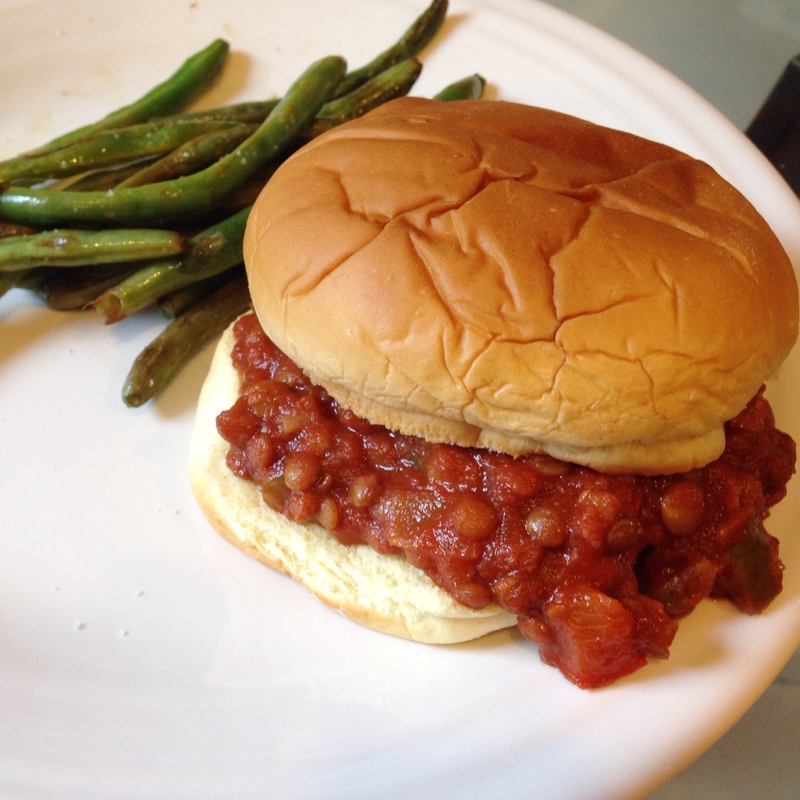 These are actually very similar to the crockpot lentil sloppy joes I made on Fox 2 Detroit a few years back, but are even easier with fewer ingredients. One difference is the balsamic vinegar. At first thought it seemed strange, but you know what the difference is between, say, ketchup and tangy barbecue sauce? Vinegar. It really gives it a nice sweet and tangy flavor at the end. These will be in the family rotation for sure. I thought they could use a little more flavor. Though the garlic was my own addition, I think next time I’ll add more seasoning — more cumin, more chili powder and go from there. They were, indeed, sloppy. I don’t think I could have cooked them down anymore to be less sloppy, but next time I might try. Really, I think that’s just how it goes. Be sure and have a good solid bun — you’ll probably still need a fork in the end. If you’re eating open-faced, you’re all set I guess. The whole family took these down — baby included (sans bun of course). We ate them with a common side dish around here — pan roasted lemon green beans. • optional toppings: onions, pickles, avocado, coleslaw, etc. 1. Heat the olive oil in a medium, heavy-bottomed pot over medium heat. Add onion, pepper and celery. Cook, stirring occasionally, 5 minutes or until softened. 2. Sprinkle in cumin and chili powder and cook an additional minute. 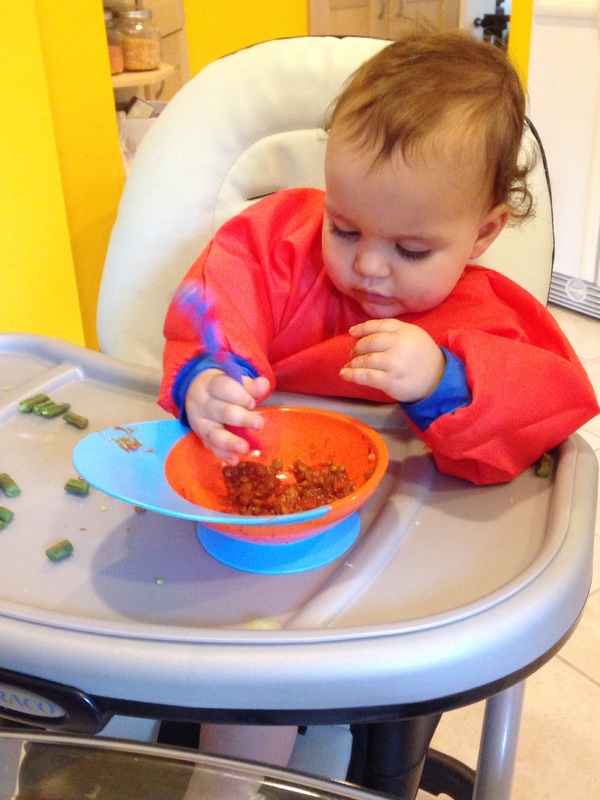 Then add tomato paste and stir to incorporate. 3. Add lentils, water, tomato sauce and hot sauce, if using. Increase heat to high and bring to a simmer. Lower heat so it’s just bubbling and cook uncovered 30 minutes, stirring occasionally. (I accidentally left covered, so my cook time was longer.) Add more water if it cooks out before 30 minutes is up. 4. Taste and if they are tender (they should be a little ‘al dente’ — have just a little bit of bite left), add salt and vinegar. Serve on buns or open-faced on toast. Look at me! Two posts in two weeks! I’m really on a roll, aren’t I? I decided I better post this ASAP or my week will get away from me. I made this for a client last week and have been craving it ever since. I finally got around to it tonight. 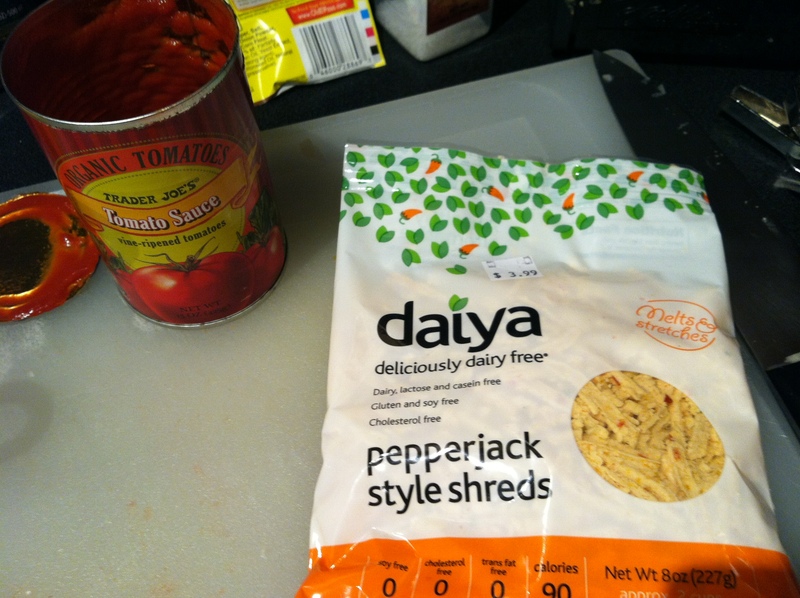 This can be vegan or just vegetarian, depending on what kind of cheese, milk and eggs (or egg replacers) you use. I chose to make it vegan. This is a really simple dish you can make with a few things you can keep in your pantry. If you have a bit of onion and some kind of bell pepper, that’s about the only produce you need (although I think I did throw some minced garlic in tonight because I can’t seem to leave garlic out of anything). This got high marks from my better half too — he couldn’t stop himself from taking extra helpings. 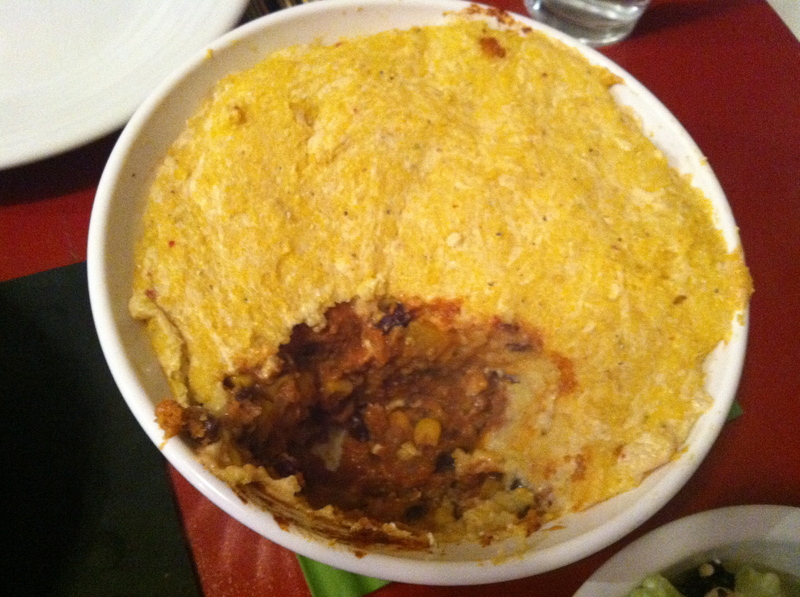 It’s really rich and filling, kind of like eating chili with cornbread all in one dish. It’s definitely a crowd pleaser and very easy to adjust the heat — throw some freshly minced jalapeno or habaneros in the early stages to kick it up a few notches. • 1 1/4 oz. taco seasoning mix (or throw some cumin, coriander, garlic powder, onion powder, etc. in and season to taste). • 2 large eggs, beaten or equivalent egg replacer (I used 3 tsp. egg replacer powder mixed with 4 Tbsp. warm water). 1. Heat oil in a medium saucepan over medium-low heat. Add onions and bell peppers and cook until vegetables are softened, about 5 minutes. Throw your minced hot peppers in at this point too if you’re using. (Just before the next step is when I threw in the garlic and cooked for 1 more minute). 2. 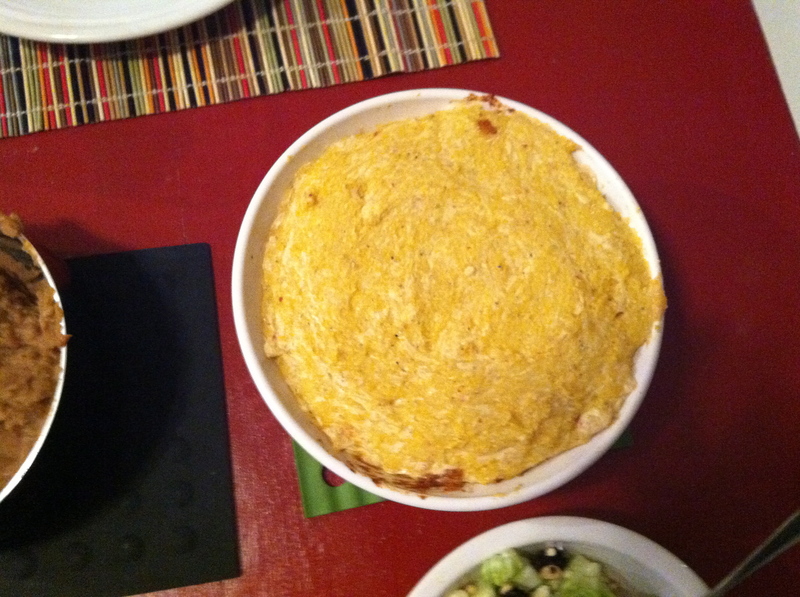 Add undrained beans, tomato sauce, corn, taco seasoning or spices, 1/2 c. of the cornmeal and 1/2 c. of cheese. Cook over low heat, stirring often, until thickened and cornmeal is cooked through, approximately 15 minutes, then put in 1 1/2- or 2- quart casserole dish. 3. Meanwhile, heat milk with remaining 3/4 c. cornmeal in a small saucepan and season to taste with salt and pepper. Cook over low heat, stirring constantly (Well, close enough. I stirred it often…) until all of the milk is absorbed. Remove from heat. Slowly add eggs or egg replacer and stir in the remaining 1/2 c. of cheese. 4. Spread over top of bean mixture and bake uncovered for about 40 minutes or until top begins to lightly brown. Mine didn’t get that far, because there were hungry mouths to feed, but it was 40 minutes and good enough. I can’t believe I waited this long to make this for my own family — I have a feeling it will stay in the winter-time rotation! They don’t necessarily stick together the best (which often is the case with homemade burgers like this), but a little more time in the oven, or a little time quickly fried in a skillet could have helped this. The flavors were great though. I ate mine dressed like a regular burger, but you could also really push the southwest flavors and top with salsa and guac. My squeeze even had one with hummus on it tonight — the possibilities are endless! 1. If grilling, preheat an outdoor grill for high heat, and lightly oil a sheet of aluminum foil. If baking, preheat oven to 375 degrees and lightly oil a baking sheet. 3. In a food processor, finely chop bell pepper, onion, and garlic (or just finely dice if you don’t have a processor), then stir into mashed beans. 4. In a small bowl, stir together egg, chili powder, cumin, and chili sauce.5. Stir the egg mixture into the mashed beans. Mix in bread crumbs until the mixture is sticky and holds together. Divide mixture into four patties.6. If grilling, place patties on foil, and grill about 8 minutes on each side. If baking, place patties on baking sheet, and bake about 10 minutes on each side. As I was leaving the house Monday morning for a day of errands and appointments, I turned to D and said, “How about I make something new tonight?” He quickly said yes, and I grabbed my trusty Veganomicon cookbook. I was trying to get out the door and knew it would be a busy day, so I went straight to the one-pot meals section and picked the first recipe I could find that sounded good and required the purchase of only a few ingredients I didn’t already have. We loved this — it takes a little prep work of chopping and dicing, but once that’s done, it comes together quickly and easily. AND this recipe made enough for each of us to eat a ton at dinner, eat lunch today and there is even more squash mixture leftover, but we ran out of the salsa. It’s pretty good on its own though, so I’m sure one of us will eat the rest tomorrow. • 1/2 c. red cooking wine (I used actual red cooking wine, but obviously if you’ve got a bottle open that you like to drink, that’s probably better! 1. Bake squash: Preheat oven to 375 degrees. Cut the squash in half (widthwise is fine, though I did it the difficult way and did it lengthwise). Scoop out the seeds, prick the skin all over with a fork and place cut side down in a baking dish containing 1 inch of water. Bake for about 45 minutes until fork can easily pierce skin. 2. After you get that in the oven, make the salsa. Mix all salsa ingredients prepared as stated above , cover and refrigerate until ready to use. 3. Prepare the bean mixture. Preheat a large heavy-bottomed skillet over medium high heat and saute the onions and jalapenos in the 1 Tbsp. of oil for about 5 minutes. Add the garlic and crushed coriander seeds (I put the seeds in a bowl and crushed with a small juice glass, since I don’t have a mortar and pestle), and saute two minutes more. Add the remaining spices, salt, and wine, raise the heat and boil for about 2 minutes, stirring often. 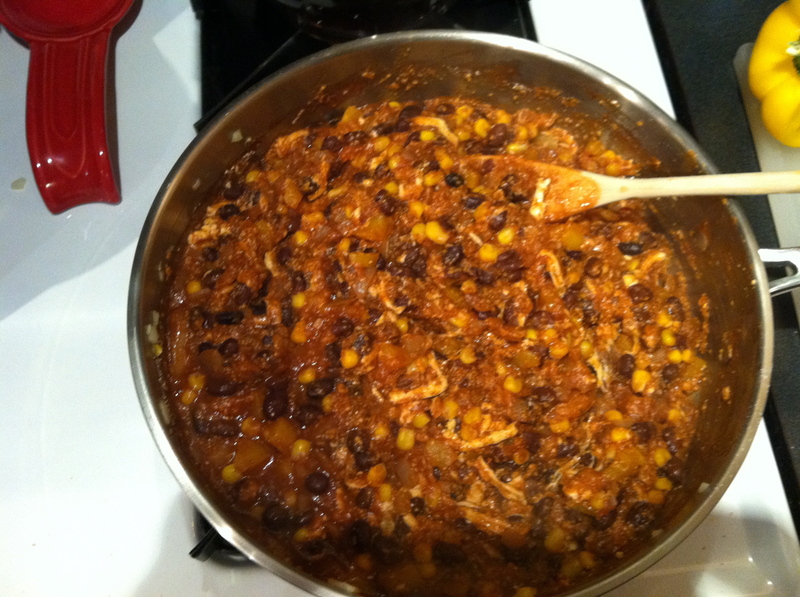 Lower the heat and add the corn, black beans and hot sauce. Cook for 5 to 7 more minutes, until the corn is heated through and the wine is full reduced. If the squash isn’t done by now, cover the bean mixture. When the squash is ready, remove from the oven and let cool for about 10 minutes, until you can handle it without burning the crap out of your hands. Cut the squash halves in half, then shred and scoop it out with a spoon or fork. Toss with bean mixture and use tongs to separate the strings and mix together. If the bean mixture has cooled too much, heat the new mixture up a little, as it should be served hot. Divide among individual plates and top with the salsa. This was delicious! I think I held back on the spice a little, since my latest Mexican venture first came out a little spicy, but I could have spiced it up more. I forget how much squash is produced when you scoop it all out, and I think that helps balance any spiciness. Next time I’ll spice it up! I think this would be a good base for various dishes, and I think the salsa would go nicely with any super spicy dish — especially spicy curries and Indian dishes. After a couple of super crazy weeks and a weekend away with the ladies, the cupboards are pretty bare at the ol’ Villa Ferndilla — or at least I thought. I started with a can of black beans and an Internet search and came up with THIS recipe from Vegetarian Times, which I modified depending on what I had. I loved these tacos! There are so many things you could do with this basic recipe to make it your very own. It was also really fast. It maybe took me about 20 minutes to make (including Internet search!). When I went to add photos to my post last night, it disappeared, and isn’t letting me add them again today. But know that these tacos are as beautiful as they are delicious. I’ll upload some photos I took when I’m able! 1. Bring beans, salsa, garlic, and 1 tsp. cumin to a simmer in saucepan. Reduce heat to medium low, and cook 5 to 6 minutes, or until soft. Remove from heat, and mash with fork to crush beans for creamier filling, if desired (I went with a fork/potato masher combo). I ended up tossing in a few (well, more than a few) shakes of Frank’s Red Hot too, which was unnecessary — the corn ended up pretty spicy in the end! Cook 5 to 10 minutes, or until golden and crispy, stirring frequently. 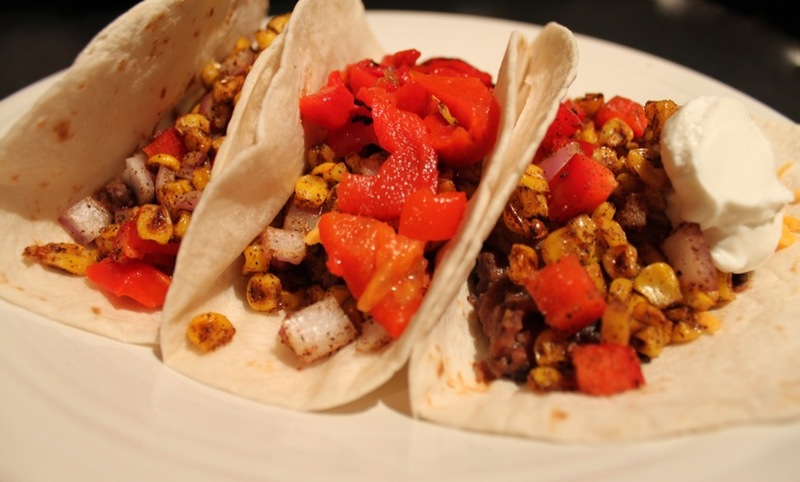 When the corn was satisfactorily a little brown/toasty, I removed from heat and tossed in some fresh chopped red onion and red pepper. I wanted to include onion somehow, but didn’t want them totally raw. 3. I heated flour tortillas in the oven for a few minutes, then filled with some of the beans, corn and roasted red peppers — putting soy cheese between the beans and corn on a couple. If you have all of the other stuff the recipe calls for, this is where you toss on the spinach leaves (really, 3 leaves per taco? ), green onions, cilantro, etc. I also ended up topping one with sour cream to try it — it definitely cooled down the spicy tacos! They say these are just as good cold and to put them together in a container for the next day. I ended up surrendering the leftovers to my squeeze, so he’ll have to let us know if that’s true! I will definitely make these again with all kinds of different ingredients. I can throwing some tofu in with the beans, or maybe making a breakfast twist with scrambled eggs if you’re into that kind of thing. Let me know if you make this recipe and add your own twist!